We’re pleased to announce that Rock Band 4, winner of multiple E3 awards including “Best Music Game” from IGN and Game Informer, is now available for digital pre-order on PlayStation! And special for PlayStation Plus members, pre-order the digital Rock Band 4 game and receive 10 additional DLC songs for free, that are only available through this exclusive offer. You also get a PS4-exclusive theme that is immediately downloadable. Rock Band 4 software will work with all PlayStation 4 Rock Band music game controllers, most previous PlayStation Rock Band and third party wireless music game controllers and microphones, as well as with your Rock Band DLC previously purchased for PlayStation. As a bonus, PlayStation Plus members who pre-order the game will receive 10 additional songs for free to play in Rock Band 4 that are only available at launch through this PlayStation-exclusive offer. Additionally, PlayStation Plus members who pre-order the game will immediately be able to download an exclusive PlayStation 4 theme. What’s New in Rock Band 4? The currently announced soundtrack includes hits from: Aerosmith, Avenged Sevenfold, The Black Keys, The Cure, Dream Theater, Elvis Presley, Fall Out Boys, Foo Fighters, Halestorm, The Killers, Paramore, Queens of the Stone Age, Rush, Scorpions, St. Vincent, The Who, and many more. More music will be announced over the course of the summer. 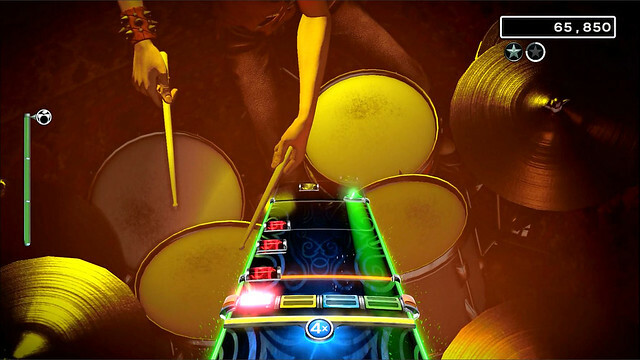 Additionally, over 1500 Rock Band 4-compatible songs will available in the game’s Music Store. Freestyle Guitar Solos – Guitarists can bust out unique guitar solos of their own with the game’s new Freestyle Guitar Solos, no lessons or music expertise needed. Freestyle Vocals – Gamers can sing it their way with advanced pitch recognition that rewards them for putting their own spin on their favorite songs. Stage Presence – Gain extra points by working the crowd into a frenzy with your vocal charisma; or through synching moves & streaks with band members. Campaign & Character Customization – Rock Band 4 features an improved campaign/story experience, allowing up to four players to create and customize their in-game avatars, form a band, and build a legendary, charting the course of their rock career through a branching narrative. We’ll continue to support and expand on the game via new tracks and new gameplay released continuously after launch. 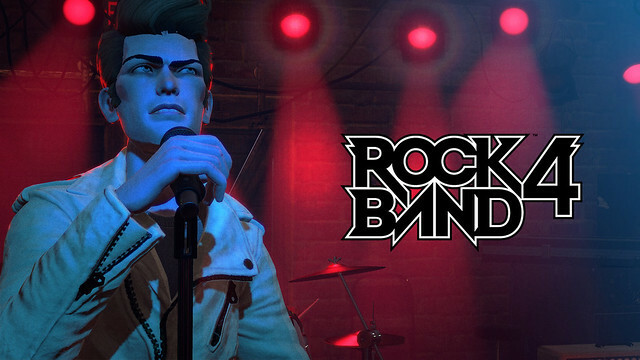 We’re excited for PlayStation fans to experience the next generation of Rock Band! For those of us who pre-ordered the PS4 version on Amazon day one, are we going to be receiving a code for this? You’ll be receiving a code from Amazon for the 34 Downloadable Tracks that comes with your Pre-Order! These 10 exclusive songs are available to PlayStation Plus members who Pre-Order Rock Band 4 via the PlayStation Network. I have a feeling these 10 songs will wind up as DLC. They’re clearly not going to be on the disk as they’re a pre-order, and Harmonix would be foolish to just burn 10 tracks like that for nothing. And it’s not like these are minor acts either. The other question I have is about the theme, will that become available for purchase? Most pre-order bonuses become available for purchase… eventually. You’ll just have to wait who knows how long to buy them. Thanks Criss. So basically, the FAQ page says that the 10 pre-order songs will be available to purchase as DLC, but the theme won’t be. How about for Europan players? Will be available to pre-order digital copy of RB4? We will be extending the program to Europe soon – stay tuned for details! This right here. This is how you convince me to preorder. Been waiting for a digital option. And love that Bring Me To The Horizon track. Now, I’d be great if I could just change the full band kit I have preordered to a bundle without the disc. Or if it included a digital voucher. I seriously doubt many of us loyal Rock Band-ers want a physical copy since all the majority of our catalog is already digital. +1 for this, I really want all the new instruments and would much rather have the digital copy of the game so I don’t have to worry about the disc. Is there any way to accomplish this without buying 2 copies of the game? All my DLC sitting on my Xbox 360 is making getting this a tough decision. I’d pull the trigger in a heartbeat if I could port my monster catalog somehow. I’m in the same boat. Huge Rock Band fan, but the prospect of not having access to my huge RB catalog bought on my Xbox 360 kills any enthusiasm I had for that new game. Actually, I’m considering buying an Xbox One just because of that game. 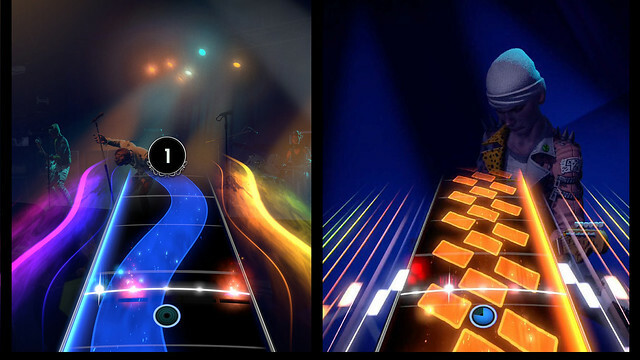 Now, if Harmonix can find a way to make cross-platform DLC from previous game work, I’m sold. And that would be feasible, I think. For instance, creating a system where you can have a “Rock Band” I.D. on Harmonix or Rock Band’s website that could be linked to both your XBL account and PSN account could probably solve that sort of problem. BUT I guess both Sony and Microsot would have to agree to this and I’m pretty sure they won’t. So I’ll pass on RB4. Sadly. For now. Until I buy an Xbox One, I guess. Same here. I went from mainly a XBOX360 user to a PS4 user. As such, I own tons of Rockband DLC tracks for XBOX360. So I have to decide between Rockband 4 on PS4 with none of my purchased content or buy a XBOX One so I get to keep my tracks. Harmonix could solve that in one fail swoop, a global account tagging what you bought on one console is yours. Having said that, the problem isn’t on Harmonix’s side of things but rather the console side of things. For as much as I love Sony, I doubt they’re would jump all over the idea of giving you a (insert dollar amount credit) for ALL your DLC just to be freely given to you. We completely understand your concerns. We’re super excited that we are able to transfer your previously purchased content for Rock Band within the same console family, but being able to transfer this content across platforms is a much more complicated process. We hope you rock out with us in the future! This is why I’ll probably never be able to buy and play Rock Band 4. I have thousands of songs for Rock Band, Rock Band 2, Rock Band 3, Lego Rock Band, Track Packs, Beatles Rock Band, Rock Band Network, etc… on my Xbox 360. No interest in an Xbox One, I’m a PS4 guy. Wish Sony & Harmonix could work something out to make this happen. Otherwise I’m unable to continue playing Rock Band going forward. Yes! I am so excited! I will be preordering with my 10% cart coupon! Thank you for making the 100 or so songs I bought off the PSN available to play in Rock Band 4! That is so huge. <3 Anything we can do to support our awesome community. Thank you for Pre-Ordering! Not to burst your bubble but you unfortunately cannot use coupons on preorders. I’m still a physical media kind of guy, any pre-order bonuses to share on that front? Particularly with Canadian retailers would be helpful. Looking forward to this in EU soon! A question – I own loads of RB3 DLC songs bought on UK PSN account. I moved back to Poland and would like to use my PL account now for RB4 on PS4. Is there any way to import PS3 RB3 DLC from one account to the other? I don’t mind those track being removed from PS3 after the import, I just don’t want to loose and rebuy all these songs on RB4… or does the import works only on the same account and I need to set up UK account on my PS4? With RB3 being my most played game I can finally move on to RB4. I can only echo the thanks from your millions…AAAND MILLIONS…of fans. Thanks guys. I’ll be preordering on payday. The 10 exclusive songs are a seller for me, but I am in need of a new guitar as well, so the lack of a bundle really hurts this option. We’ll have standalone instruments available for purchase in early 2016! Too bad I’ll be missing out on this release this year. Hopefully the bundle will still sell next year because I have never played Rock Band before and I really want to play with the drum kit. Not sure how i feel about this. I have the new guitar + game bundle pre-ordered from Amazon but my old RB 3 guitar is still kicking around somewhere. Maybe I should cancel my physical pre-order and use the old hardware. That way I won’t have a disk to worry about (hate physical media!) and I’ll get these 10 songs free. I have the PS3 Guitar, does it work on PS4? Yes indeed they do. Compatibility with PS3 downloaded songs and hardware is one of the greatest selling points of Rock Band 4. so yes, if your old guitar works still, then you can use it on Rock Band 4 on PS4. I’m kind of stuck between a rock and a hard place, knowing that I’m getting the Band in a Box version, but also have to pre-order the digital version just to get the extra tracks. IT won’t hurt too much because I was planning on having the digital AND physical copies because I wanted instruments but I wanted the game to remain on my hard drive, so it’s not so bad. Especially since I got Amazon’s PRe-order price guarantee, so I saved like 40 bucks on it, so this doesn’t hurt too much. Having said that, you may also want to looking into the RB4 guitar controller too. It’s built a bit better than any of the PS3 guitars, and will sooner or later be solely available for purchase rather than Game+Guitar or Game+Band bundles you can get at brick & mortar stores. Any word on how exported tracks from Rock Band 1 and 3 will work? Rock Band 1 being the biggest question since exporting tracks had to be done directly off the game disc and not through use of a code like 2, Lego and Green Day. Also on the RB1 subject, I’ve noticed that “Day Late Dollar Short” is one of the 30 pre-order tracks offered for the physical game, so is it even going to be possible to import RB1 tracks into 4? If you have previously exported legacy Rock Band titles (Rock Band 1, Rock Band 2, Lego: Rock Band, Green Day: Rock Band), this content will be available for free re-download within the same console family as we make that content available! I’m guessing the 30 song pre-order bonus for retail doesn’t apply to PSN? So I’d have to pre-order both versions to get all of the potential songs? That’s kind of lame. Treat your customers like they’re fans and not cows to milk when it’s convenient. Check out this FAQ for answers about PlayStation Digital Pre-Orders: http://forums.harmonixmusic.com/discussion/258838/rock-band-4-digital-pre-orders-on-playstation-4-now-available#latest! Sad to see there’s no Keys support even for replacing (Bass) Guitar. It was my favorite instrument for RB3. Pro mode will be missed too. I’ve also been holding out on ordering until supports for Keyboard is added back, which I was told elsewhere would be done post-release. You almost had me with The Reflex, but without Keyboard support I’m still on the fence. I can understand not supporting the Pro Guitar, which was niche and just doesn’t have the audience to justify the intensive authoring those tracks require. Since the keyboard was a pack-in with RB3, not advertising Keyboard support more heavily is likely going to keep working against the value proposition. I’d also like some details on the import function from RB3, Beatles, and the RB2 Track Packs. Do we still need those discs, or will the tracks associated with our PSN ID/Plus saves just carry over automatically? The latter would be swell. That’s actually not true! These 10 songs that are available to PlayStation Plus members will be available to purchase as DLC. PlayStation Plus members will also receive the exclusive PS4 theme that is available for immediate download. Check out our FAQ on PlayStation Digital Pre-Orders here: http://forums.harmonixmusic.com/discussion/258838/rock-band-4-digital-pre-orders-on-playstation-4-now-available#latest! I have guitar hero microphone, guitars and drum set. i see “most third party peripherals” – does that include guitar hero intruments? Any information on when the cymbal kits will be available? If I pre-order the digital version, will I get the other 30 bonus songs that are available in the other pre-orders? If you Pre-Order Rock Band 4 via the PlayStation Network, you will get a code for the 10 songs mentioned above. 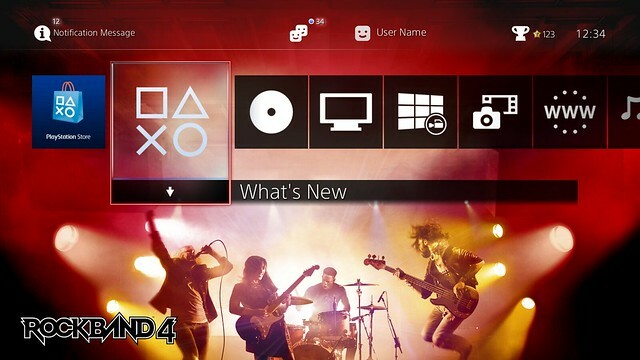 PlayStation Plus members will also receive an exclusive PS4 Rock Band 4 theme for immediate download. If you Pre-Order Rock Band 4 through other eligible retailers, you will receive the 34 bonus songs with that Pre-Order. Check out our FAQ on PlayStation Digital Pre-Orders for more answers and song availability: http://forums.harmonixmusic.com/discussion/258838/rock-band-4-digital-pre-orders-on-playstation-4-now-available#latest! I’d love to pre-order the digital version but I also need all of the new instruments. Will there be a bundle of instruments only for those of us that buy the digital version? I don’t think so, I wish they did so that I could continue playing Beatles Rockband, but I’m pretty sure the new instruments will not work on PS3. Nope! Rock Band 4 instruments are compatible with the PlayStation 4 and Xbox One only, depending on which platform you rock out on. On the other hand, legacy wireless Rock Band instruments will work in Rock Band 4! I have the Beatles Rock Band instruments. Those are included on the supported instruments? Yes! As long as they are within the same console family, your legacy wireless Rock Band instruments will function with Rock Band 4! If you buy this digitally, will you have to buy the guitar separately? Yes! This is an exclusive offer for the digital pre-order of Rock Band 4 on the PlayStation 4. Can we get something other than alt pop or classic rock painters is a bonus but I would love more from the Sword, Umphrey’s McGee, or maybe some Russian Circles! We have a song request portal! Tell us what songs you want to play in Rock Band 4 here: rockband.com/request! This is pretty crappy in my opinion. You know perfectly well that most of us are buying a hardware bundle, and then you offer digital exclusive songs that will never be available again? I am not buying 2 copies, that’s a hard pass. Oh “only available at launch through this PlayStation-exclusive offer.” So I can buy them later as DLC? If so, carry on. Check out this FAQ on PlayStation Digital Pre-Orders: http://forums.harmonixmusic.com/discussion/258838/rock-band-4-digital-pre-orders-on-playstation-4-now-available#latest! Will we be able to delete individual songs from a pack this time around (like the other system was capable of), or is still the whole pack or nothing? “more than 60 tracks” is a little disappointing since Rock Band 3 included 83 songs. But it’s awesome that the game will work with last generation DLC and most last gen controllers. Thanks for putting in the hard work to make that happen! I’m glad to see this franchise make a comeback. Please give us some more full album downloads. I definitely would love the Trivium discography, especially Shogun. Send us your favorite songs that you want to play in Rock Band 4 through our request portal: rockband.com/request! Thank you Harmonix for coming back! I have over 600 songs through the DLC and by purchasing every “rippable” Rock Band game (and yes, even The Beatles, which I wish I could rip….). I’m looking forward to bringing this all forward and getting a new Rock Band Guiltar! Unfortunately, that’ll mean I won’t get these 10 songs but I am looking forward to playing the new game, especially with the voice and guitar freestyling. Okay, these pre-order bonuses are getting out of hand. If I were to get the game, it’s from a retailer just in spite of this terrible practice. Honestly, I’m not too concerned about these songs considering how everyone save for Pantera on this list is dreadful to listen to. We respect everyone’s opinion. We hope you find something you love in our 1,500+ DLC library! I’m sure that Rock Band 4 will be fun, but all my DLC is on Xbox 360, and I’m done with Xbox… so unless Harmonix finds a way to implement cross-platform compatibility or at least purchase verification to allow us to get the same DLC free on PSN – I’ll be passing on this one. Not to mention, the price to get the instrument bundle is too steep…. and my old ones are failing pretty bad with non-responsive buttons and whatnot, just from not being used. I’m in the same boat. 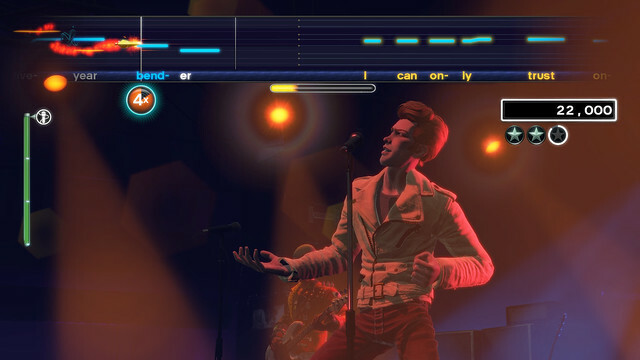 Rock Band was supposed to be a platform… except it’s tied to certain consoles. Harmonix needs to get it’s act together and create a Rock Band ID that links your Xbox/Playstation accounts so that regardless of what platform you own a future version of Rock Band on… you can continue to rock out with your previous purchases. Rock Band should be a platform. Appreciate the bonus 10 songs for free. Back with PS3, I loved expanding my rock band collection! My only gripe is that you will be offering 44 free songs to PS4 owners, but it’s impossible for someone to take advantage and get all 44 songs without having to purchase the game twice (once off PSN and once off Amazon). I unfortunately won’t be able to take advantage of these bonus 10 songs because I definitely need the instruments that I can only get via a physical copy or else I can’t even play. Hope you consider broadening the criteria to obtain these 10 songs so those of us who still need instruments can still take advantage of it. Maybe if you sign on to PS Plus during launch week? No worries on that end! These 10 songs will be available for purchase as DLC. Check out our FAQ on PlayStation Digital Pre-Orders for more answers: http://forums.harmonixmusic.com/discussion/258838/rock-band-4-digital-pre-orders-on-playstation-4-now-available#latest! Is there still time to export songs from past Rock Band games to Rock Band 4? I wanna be able to play as many songs from past games as possible. 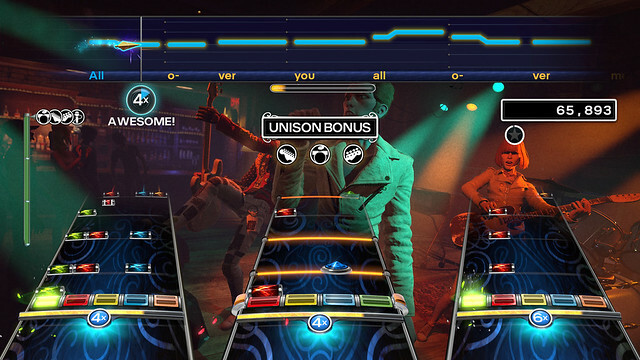 Will there be a Rock Band 3 export option so we can play our RB3 songs on Rock Band 4? Plus will we also get the 34 additional songs that are a pre-order bonus at other places? We’re looking into the possibility of exporting Rock Band 3, but we don’t yet have a definitive answer. If you pre-order at eligible retailers, you will receive the 34 additional songs from that retailer! This PlayStation exclusive digital pre-order will get you the 10 songs listed above. Check out this FAQ on PlayStation Digital Pre-Orders: http://forums.harmonixmusic.com/discussion/258838/rock-band-4-digital-pre-orders-on-playstation-4-now-available#latest! That theme is so tempting…. but I feel like I gotta go with one of the physical bundles here; at the very least my guitar needs the replacement, it’s been played so much. We hope you’ll rock out with us soon! You’ll be happy to know that all pre-order bonus tracks will be available for purchase in the Rock Band Music Store. Stay tuned for details on availability! Dead Freakin Sara!!!! Yes! They should just drop their whole first and second album on RB4. Preorder done! i just read the comments but i´m still confused about something. ONLY Wireless instruments from ps3 will work in RB4? or will l be able to use the wired intruments as well? We’ll have more information on all compatible instruments closer to launch! We haven’t split our DLC! All pre-order bonus tracks will be available for purchase in the Rock Band Music Store. Stay tuned for details on availability. Will it be possible to buy the new instruments without the game? Like can I pre-order the digital version of the game and later buy the new instruments? Yes you can! Standalone instruments will be available for purchase in early 2016. While I like the idea in theory, it seems very counter-productive with the first game on a new platform having this as a digital-only preorder bonus. I like many others will be pre-ordering on Amazon as I will be buying the ‘band in a box’ kit and am a little bit irked, it just seems a very odd choice. All pre-order bonus tracks will be available for purchase in the Rock Band Music Store. Stay tuned for details on availability! Harmonic needs to stop saying all Rock Band controllers will work with 4 if the Ion Drum Rockers do not. That is incredibly shady. They were official drums with Rock Band branding. Shame on you. 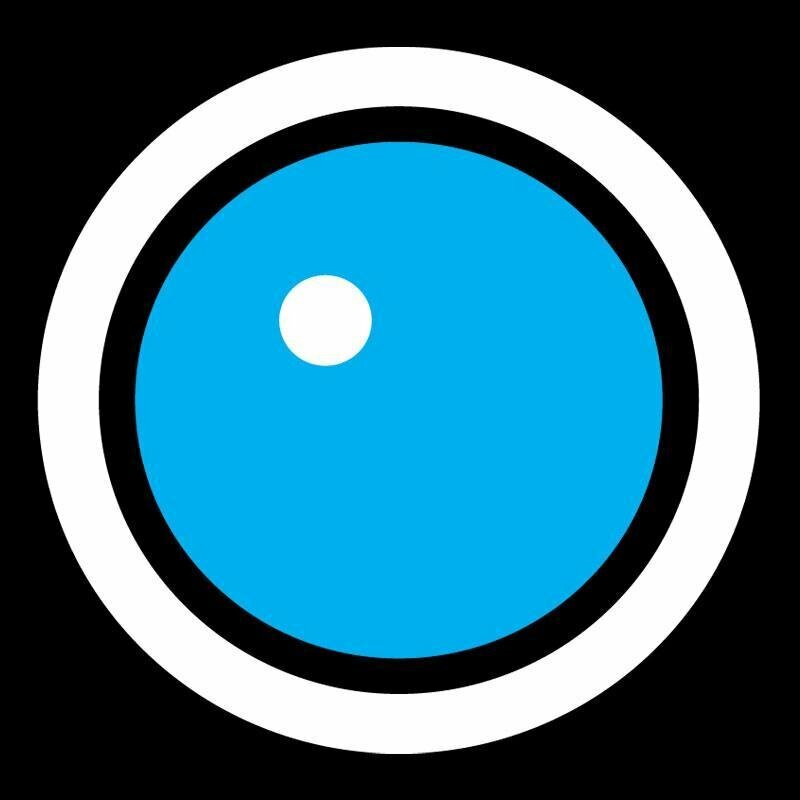 Harmonix did work with ION in the sense that we licensed our software for ION to create a compatible drum kit for the game. However, ION Audio is responsible for the manufacturing of these instruments. Compatibility is a function of hardware, not software, or it would be much easier to confirm ION support in Rock Band 4! Contact ION Audio to request ION support in Rock Band 4: http://www.ionaudio.com/support/! It’s Harmonix’s responsibility to put the drivers in the game. That’s not how programming works, Criss. Why would you make this offer ps+ exclusive? It’s confirmed that online multiplayer is cut off, so we done need ps+ to fully enjoy the game. Now I think about getting a 1 month subscribtion. BUT will I be able to keep the free RB4 theme/10 DLC songs after the subscription runs out? Read Criss’s reply to #2. Details for Europe are coming soon. To answer your previous question, obviously they made a deal with Sony to make this exclusive to PlayStation Plus. If your PS+ membership expires, you still keep anything you paid for. So you should still have the theme and 10 bonus songs. You mainly just lose access to the free monthly games.